For the purpose of understanding, when Ra talks about the Harvest, he means the shift, the prescise moment where humanity will shift into 4th density. IV. WHAT IS THE DENSITY LEVEL OF PLANET EARTH NOW? RA: Your planet is 3rd density in the beingness of its peoples, but the planet is now in a 4th density space/time continuum. V. HOW DOES A 3RD DENSITY PLANET BECOME A 4TH DENSITY PLANET? RA. The 4th density is as regularized in its approach as the striking of a clock upon the hour. Your planetary sphere has spiraled into space/time of a different vibrational configuration. This causes the planetary sphere to be molded by these new distortions. However, the thought-forms of your people vary greatly and are not able to point in one direction. Thus the harvest will be such that many will repeat the 3rd density cycle. The energies of your Wanderers, your teachers, and your adepts at this time are all bent upon increasing the harvest. However there are few to harvest. RA: The harvest is now. There is at this time no reason to aim for longevity, but rather to encourage efforts toward seeking the heart of the self, for this which resides clearly in the violet-ray energy field will determine the harvesting of each person. RA: You must see the Earth as being 7 planets. There is red, orange, yellow, and there will soon be a completed green color vibratory locus for 4th density entities which they will call Earth. because the early 4th density entity will not know precisely how to remain undetectable by 3rd density. Thus in 4th density the red, orange and green energy nexi (centers) of your planet will be activated while the yellow is in potentiation along with blue and indigo. QUESTION: The Earth seems to be negative. So why will Earth go into 4th density positive instead of 4th density negative? RA: For those of harvestable quality, those oriented in the ways of service to others greatly outnumber those whose orientation is toward service to self. QUESTION: As we enter the 4th density there will be a 3 way split. (3) Unharvestable entities going to another 3rd density planet. QUESTION: What will we lose as the yellow goes from activation into potentiation and what will we gain as green comes into total activation? RA: It is misleading to speak of gains and losses. It is to be kept in the forefront of your thinking that there is one creation in which there is no loss. RA: If a 3rd density entity were electrically aware of 4th density in full, the 3rd density electrical fields would fail due to incompatibility. QUESTION: As this transition continues into 4th density activation, in order to inhabit this 4th density earth it will be necessary for all 3rd density physical bodies to go through the process which we refer to as death. Is this correct? [NOTE: This is the most widely misunderstood quote in the Law of One series. Context reveals that Ra is referring to a transmutation, not any type of death as we would normally think of it. This is an ecstatic feeling — the most incredible moment of any lifetime you’ve ever had as a human being. Elsewhere Ra says you CAN reconstitute your third-density body after this happens if you so choose — you simply have to focus on a "more difficult configuration" to get it back. QUESTION: The book Oahspe says that if an entity is over 51% service to others and less than 50% service to self, then the entity is harvestable for the positive 4th dimensional level. RA: This is correct. The negative path is quite difficult for attaining harvestability and requires great dedication. and 5% service to others. QUESTION: Does this mean these two percentages for the positive and negative path yield the same rate of vibration? RA: The vibratory rates are not to be understood as the same in the positive and negative orientations. They are to be understood as having the power to accept and work with intelligent infinity to a certain degree or intensity. Neither the blue or green vibratory energies are seen in the vibratory patterns of negative 4th and 5th rates of vibration. On the other hand, the positive entity has the full spectrum of true color time/space vibratory patterns. Each is capable of doing 4th density work. This is the criteria for harvest. those entities which are unbalanced, especially as to the primary rays (red, yellow and blue) will not be capable of sustaining the impact of the love and light of intelligent infinity to the extent necessary for harvest. QUESTION: Is each chakra activated to completion and greatest intensity by the end of the experience of each density? RA: Hypothetically speaking, this is correct. However, the fully activated being is rare. IT IS NECESSARY FOR GRADUATION ACROSS DENSITIES FOR THE PRIMARY ENERGY CENTERS TO BE FUNCTIONING IN SUCH A WAY AS TO COMMUNICATE WITH INTELLIGENT INFINITY AND TO APPRECIATE AND BASK IN THIS LIGHT IN ALL ITS PURITY. However, to fully activate each energy center is the mastery of the few, for each center has a variable speed of rotation or activity. The important observation to be made once all necessary centers are activated to the minimal necessary degree is the harmony and balance between these energy centers. QUESTION: It is not necessary for an entity to be consciously aware of the Law of One to go from 3rd to 4th density. Is this correct? D. FOR WHICH HARVEST IS AWARENESS OF THE LAW OF ONE NEEDED? QUESTION: At what point in the densities is it necessary for an entity to be consciously aware of the law of One in order to progress? RA: The 5th density harvest is of those whose vibratory distortions consciously accept the honor/duty of the Law of One. I recieved this channeling post from a dear friend that is known to me-hopefully she will join us here at Avalon soon!! Enjoy-as it gladdened my heart that there is much going on!! There are signs along our way!! Greetings Dear Ones! I am Metatron, Lord of Light, and I welcome each of you to this moment of sharing. There are certain lifetimes that are more high-lited within your vast sojourns, certain vectors in space-time that offer quantum leaps. Within these are crucial crossroads of decision that define you. This is one of those. Energy and time are moving fast, much is happening on your Earth as you prepare for the Cosmic Trigger and the Ascension draws yet closer. Mankind is awakening from an epoch of illusive chimera, and the heralded dreamers are clearing the wool from their eyes, rising from a dreamscape tapestry woven from a misty journey that began long long ago. The Siren still sings, ever so faintly to lull the weary back to sleep. Yet the small voice inside the awakened dreamer calls to reveille. The deep yearning for clear mind rings forth! Take your Power! Ye are GODS! Awaken to your true being, and find the knowledge that yields Wisdom! You have toiled many many miles along the perilous climb to the sacred mountaintop. You have come far, the summit is before you. Dear Ones, find strength, find the heart that summons True Wisdom! These are within you. Break free of the entangling web and fading call of the Siren. Your treasure is before you! The Wise Warrior of Light knows that wisdom is the true treasure and that it is within. It is not hidden; it is the golden thread that weaves one reality to another, one world to another, and one dimension to the next. The voice of wisdom is within you. Hear its call, it is the One True Voice that offers LOVE to All, it is the voice of the Ascension. Indeed you have waited many many eons to be here at this time. And so as you prepare for the final climb to Ascension, know that we are with you each step of the way. The Pyramid of Awakening lies before you, its mystery revealed. It is the time of the Cosmic Trigger, dawning 2012. And so we speak again on the enigma of the Pyramids. Question to AAMetatron: In reference to the receiving points of the coded light of the Cosmic Trigger, can you expand on the alignments of Giza and the Moody Gardens Pyramids? AAMetatron: Yes, of course; indeed they are aligned and with great purpose!They are both located very near 30 degrees latitude, and both tri pyramidal complexes. The two form an energy pattern of the Vesica Pisces on the Earth, with each complex forming the center of the two circles. Both complexes are aligned to star systems. Giza to Orion. Moody to Sirius. Complex is dedicated to the honoring of the Sirius binary systems of A and B. It is in honor of the Dolphin, and indeed contains the energy and guardianship of the Dolphin. While the Blue Pyramid in Galveston does not presently have dolphins physically inside its aquarium, Master Dolphins occupy its energy. Pods of dolphin swim in the bay surrounding the island. In parallel they can indeed be seen and heard. The fact that both are precisely positioned between the 29 and 30 degree latitudes is quite significant, in terms of gravitational electromagnetic placement. As such their geographic bearings between the northern pole and equator enable their solar angles at the equinoxes and solstices to be particularly robust in relation to sacred phi alignment. So these two tri complexes are predisposed to receive the Cosmic Trigger and disperse these coded light energies to satellite complexes for activating the magnetic releases of the Return of the Dove. Indeed, it is specifically because these complexes are triangulated triple pyramid complexes that enable them to so powerfully serve as the receivers and transmitters of the Cosmic Trigger. The Atlantean masters always triangulated pyramids for specific receival and transmitting purposes. Their placement is quite deliberate, and corresponds to true north and magnetic north at favorable harmonics. There is indeed a very a unique and unparagoned energy pulse that occurs between Giza and the Pyramids of Galveston. The pulse that existed has been reformed. We have told you that the Galveston placement is within 5 miles of an Atlantean Pyramid complex that is now submerged in the Gulf waters. The Moody Complex has taken on this preformed paradigm of these ancient pyramids. The pulse previously occurred between these two, you see. The deliberate placement is amplified at these specific vectors; the 30-degree latitude is a conduit of very significant energies and connects thru all northern hemisphere continents. Pyramids placed along these areas, and latitudes betwixt 30 degrees and 15 degrees north are more capable of receiving concentrated telluric and solar energies. It can and does accumulate very potently inside pyramidal complexes along these parallels. This is well understood for Giza. You will soon discover first hand in the Moody Pyramid complex that this robust expansive energy can be experienced deeply at these alignments. An extraordinary experience will occur for many within the Blue Pyramid and indeed at Giza. It is no random occurrence that numerous sacred sites and powernodes occur quite abundantly along certain latitudinal and longitudinal gradients. Thirty-degree parallel north is one of these. Besides being energy accumulators pyramids are natural dimensional gateways that cohere and connect what you term the etheric dimensions. Giza and Galveston in a sense then are the male-female balance of the Vesica Pisces grid formed between them. There is also a sound octave connection, or commonality between the Galveston and Giza complexes. Certain sounds need to be toned in both to activate the dimensional gateways, and prepare for the Trigger. Question to AAMetatron: Can you explain the sound connection and process? AAMetatron: Both complexes are sound activated. Part of what we are requesting the Earth-Keeper Guild to do in the Blue Pyramid at Galveston is to reverberate specific vowel sounds on the equinox. Because of the accumulator abilities of pyramids, there are specific inner and outer dimensional doorways within them that can be sound activated for anchoring in the Feminine-Platinum Ray. This will be facilitated from parallel by the Sirian A entourage, the Cetean Master Dolphins. We have told you that the ancient skull called Max was taken into the Moody Pyramids years ago. That enabled the frequential pattern of the submerged Atlantean complex near Galveston Island to be transferred and formatted into the Moody complex. So, there are dimensional doors inside certain Phi Pyramids, and this is especially true for Galveston and Giza. There are also etheric, invisible pyramids, that are formed around these pyramids. These etheric versions are dimensional reflections that mirror frequential light energies such that they are not perceivable in the spectrum of visible light, but certain sound pitches can make them faintly visible. There are etheric chambers that need to be activated in the Moody complex, and these are energetically gated to Giza. These are structures engineered with great complexity. Phi sound patterns can physically materialize them, but if these patterns aren't given then the structures are less accessible. That is why certain Earth-Keepers are drawn to participate and direct energies into these two specifically. All etheric structures have their own sound patterns that help form their structure, just as occurs in physical objects. Phi sound bonds the atoms and molecules of physical objects, as well as cohesively structures etheric plasma and light. This is precisely why pyramids last so long in physical format and appear and reappear in etheric dimensions. Question to AAMetatron: Please review the process of the Cosmic Trigger specific to how it should be received in the Moody Pyramid Complex? These areas will spiral energies that will cover the planet and rise to the ionosphere. This release will be an extraordinary form of refined magnetic energy, uniquely capable of harmonizing in synergistic utility with Crystalline Energies. Question to AAMetatron: Thank you. Now, to switch to Giza, it is a fascinating complex and its origin is intriguing. Can you give the age of the Pyramids at Giza? AAMetatron: There is an applicable saying that we will quote from the Egyptian lands: "Man Fears Time, and Time Fears the Pyramids". It is indeed a wise saying, for in nonlinear aspect the Giza complex is timeless, and from that perspective your question cannot be precisely answered. Mankind has sought for millennia to understand the Pyramids, especially the time of construction of the great tri pyramidal complex in Giza. The timing of the construct is paradoxical, because pyramids exist by their nature in more than one reality. They are truly multidimensional. Although this will be meaningless to most of you, we will tell you this TRUTH. Certain Orion Masters and the savants of the Atla Ra, directed by Thoth first visualized the Great Giza Pyramid 38,000 years ago. Yet that is also a fleeting number, and hard for the channel to receive or grasp, because they have since dematerialized and manifested again. It occurred again some 12,500 years ago, you see? The same is true of the Galveston complex. What has been recently reconstructed is in essence the re-manifestation of the Atlantean complex that reigned there millennia ago. What stands in the ethers around this complex are the ancient tiered Pyramids of Atlantis. We realize this is confusing, so consider this: Your religious texts tell you that Creator God is Omnipotent, alpha and omega, with no beginning and no end. That is a sacred Truth, an axiom that mankind must accept, even if it is seemingly incomprehensible. Likewise we have told you that sacred geometry is the fabric of all universes, so we ask you to accept another axiom, that phi geometry is equally timeless, and has always been so within and without form. The complex at Giza has then from a quantum perspective always existed. Once true Phi Pyramidal complexes are formed, they are capable of spawning reflection replicates of themselves in multidimensionality and inverses of themselves in parallel and antimatter. This is true of all of the geometric forms that resonate to Phi, including the forms you refer to as the platonic solids. So the paradox is that once certain pyramids are constructed they have no beginning or end within your linear times. The Giza Pyramids have in truth disappeared and reappeared several times dimensionally speaking. So although this is difficult for you to understand, once manifested into octahedronal phi and inverse pyramidal format, these geometric structures become fluid hologramic inserts, circularly oscillating between dimensional reality and the timeless void. They flash and flux according to their own cycles, with no single fixed beginning point in the linear perception of 3d. So in Giza there is in truth more than one version of the Great Pyramid standing there, even though most humans only see one. In your linear 3d space - time there appears to be only stone structures, fixed and adhered to the earth in the way of any other 'man-made' structure. So to attempt to subjectively identify these structures as simply fixed forms of matter would be a distortion and detriment to your ability to understand their myriad complexity as doorways to higher dimension. As such if you were to enter these pyramids with such limited belief you would not interface with the frequency in proper attunement. If you will attempt to see its dissonance or its disappearance you would equally gain very little. Truly if man attempts to subjectively define the process it would not be of benefit, because phi pyramids become living holograms with conscious sentience that ever expands and redefines itself in exponential paradigms of higher dimensional geometry. Visualize that they were physically erected, created in stone through phi acoustics, out of sound. Then the celestial sonic dissonance dissolved and integrated them into multidimensional and antimatter energy layers. That process has a type of intra-dimensional respiration, an expansion and contraction that both materializes and dematerializes them at certain alignments. It creates a supra-concentrated interdimensional spacial bonding. Question to AAMetatron: I am confused. You mention a construction point with Thoth and the Orion Masters around 38,000 years ago. Isn't that a beginning point? reality. So in the micro and macro Cosmos there is no beginning and end. When beginnings and endings are spoken of, the implication is always there, that there must be but one reality, and that it must have a beginning in time and an ending in time. Its an illusion of ed. Your Earth is infinite and connected to myriad worlds. The Pyramids at Giza are a conduit that connects them all. There are many such pyramids and conduits that serve this role, but none quite so potently as Giza. And Masters, there is much much more that occurs in such points. The unique aspects of your particular physical world, within your specific NOW, are quite dependent on your existence and perceptions in it. As such the physical universe does not contain physical objects that can be perceived by those whose existence is not within your collective NOW. Many other, many alternate forms of reality and consciousness coincide and coexist exist within the same space that your present earth occupies. Your simultaneous lifetimes exist on these, and it is the same space you live in, but other versions of you do not perceive the same physical objects you do because these other parallels are of a different frequency. Just as AM and FM radio waves travel in the same space, so do parallel realities exist in the same spaceless illusion of physical space. Now, there are exceptions, as certain vectors of your paradigms can and do interface at specific flash-points. These are stargates, portals, and wormholes, in your vernacular. But you are many years from understanding this. These points on your planet are not understood, and are vastly unrecognized. Yet they exist on many points on the earth. And within these magnificent portals realities merge. Multidimensionality is a validity of the unified field, of quantum physics. It exists, it is real. It is not science fiction, but it is science! Few of you are able to adjustyour frequency within these points of multidimensionality to fully explore them, but you indeed have the opportunity to expand within them. The Pyramids at Giza, and indeed at other such points were built precisely on such points. That is why more than one Great Pyramid exists at Giza, because many dimensions interface there. That is possible because these streams of interface contain great energy potential; they are unified vector-points where realities merge. There are main coordinate points, lucid, undiluted energies of impeccable geometric mathematics celestially beyond the Phi of the Creation code you term the golden spiral. These are sources of fantastic energy, and these points are numerous on the planet, and each of them carries satellite points around them. They are vast in number and are pulsing and growing in energy as you approach the Ascension. concepts that he feels may be beyond most of our readers here, but in highly simplified terms, these interface points provide the coded light-force of life itself, and provide the means for thought to be solidified into physical matter or for probable events to be manifested and coagulated into experience. On a higher level, all of you understand this, despite your groans of incomprehension. It is only your duality filters, your relatively limited grasp within the illusion of human existence on the earth plane that makes this seem so unlikely. So understand that these power vector points are in essence life force generators. There are twelve such interface points that connect all paradigms, all probable and parallel realities. The Cosmic Trigger of 2009 is reforming the availability and compatible intensity of these conduits to the earth. These interfaces have always existed, but they are now becoming more accessible in higher frequency. The Pyramid at Giza sits on one of the most powerful points as such, on your planet, and the Moody Pyramids in Galveston will in time act as a coordinate of this energy. Your 144-Crystalline Grid and its evolving elliptical Firmament are the emerging transducers of greater formats of this stunning, omnipotent energy. Question to Metatron: Okay. With the axiom that the Pyramids are timeless, and there are fluid points where they appeared and disappeared, was there a time then when they were physically constructed, or were they manifested and instantly appeared into physical reality? Was there a physical process around erecting them? AAMetatron: We thought we just answered that. Yes, the current physical structure you see in 3d was erected in the probably time frames we have given. Question to AAMetatron: Okay, my point was to ask you how they were physically constructed? Were the blocks cut and if so how were they lifted so precisely in place? AAMetatron: The blocks were indeed quarried and cut and lifted into place. They were done so by a sophisticated knowledge of sound and light. Sound has many utilizations that are capable of altering matter and gravitational forces, even to the manner in which atomic and subatomic particulate respond to one another. So the lifting in place of massive tonnage of the pyramidal rock employed these sophisticated techniques, using sound and precise mathematical calculations synergized with focal mental process. In other words, matter, in this case the granite blocks were manipulated on an atomic level, and lifted through sound. This was done by Atla-Ra Masters, with extraterrestrials, as we have forementioned, utilizing a sort of crystalline tuning fork that became activated by chanting specific frequencies. The frequencies created an energy field that could be directed. Then with processes of thought manifestation using theta level visualization in tandem with deep vowel-hum pitches at extreme octaves, they charged the stones and indeed the very space where the pyramid was to be placed. The Masters of the architectural guild used extreme focal thought to construct specific angular junctions in the ethers and bonded them in a cohesive manner. They employed a type of instrument that is similar to a tuning fork. The instrument was activated thru sound made in unison toning, toning that at intervals was not audible to the human ear, and at other times quite piercing. The tone would reverberate so intensely that energy broke down matter and superimposed extreme gravitational and antigravitational forces and then it was directed and focused directionally and dimensionally. The energy encompassed the blocks, and they could be lifted with it. The savants then guided them. Men, savant arch priests, were used in teams to operate the instruments, and meditatively put the stones in place and guide them, but not to lift or carry them. The tuning fork, as mentioned, once activated (and indeed activating them was no small feat) had an amazing cohesive effect that bound atomic particulate as well as surrounding them in antigravitational plasma. (It was the a similar process that the Atla used to 'float' the Crystalline satellite of Atla, called the Second-Moon of Atlantis). The Thothian Atla-Egyptians were helped by the Arcturians and Sirians as to how to manifest the Phi Pyramids into both physical and etheric, into linear and circular time-space. Sound, you see, is capable of changing atomic structure, and the way electrons and protons react to one another. It was the same process that could make metals float, that was used to lift the stones. It became known as the art of alchemy, but that concept is greatly misunderstood, and isn't exactly what was used here, you see. The Phi Crystals you call Vogels, are capable when teamed with certain sound frequencies of incredible effects on matter. They are also capable of healing broken bones faster, and rejuvenating certain organs within the body physical. Thus, crystalline sound in specific octaves of phi has an effect upon both organic and inorganic matter. Sound is a causal force in every dimension. As such it can be used not just to lift matter, but also to bond structures more securely, as such it can be used, to cohesively reinforce structures. This is why the pyramids cannot be destroyed. You see the 3-d physical world that you daily perceive is made up of an invisible matrix template, of energy prints or patterns. These patterns are somewhat liquid or formless. So while they indeed exist, their final form in matter is a result of probability, consciousness influenced probability. There are myriad important properties of pyramids that are not as yet understood by mankind. This is especially true in the Giza complex, where the pyramids are energetically attuned to specific light-sound octaves. Many of the hieroglyphic symbols etched on the walls and chambers of the Egyptian Pyramids are instructional guides revealing specific sonic pitches that when sounded activate them into greater dimensionality. The phi octave sound triggers reverberations that automatically open up myriad gateways leading to fantastic and as yet undiscovered mysteries, ancient alchemical knowledge. But this is for those who are true seekers, those who thirst for knowledge and are willing to work to attain it. These secrets are for all, all who have the necessary light quotient to learn and understand the use of specific vibratory sound octaves. There are certain lessons that each density teaches mankind, which each of you must pass through in order to achieve the vibratory level necessary for the next level. Each vibratory level, then, could be likened to an archetype for a specific lesson that needs to be learned, for each of the trinity components of your BEING: Spiritual, Mental, and Physical, Body, Mind and Soul. So do not expect to walk into a Pyramid and land on the steps of Peters Gate. If you are unwilling or unable to employ the disciplines of breath, tone and meditational mind, you may simply be sitting in a building. Your religious scripts write. " All Things Cometh to He Who Waiteth" A wise man added, "If He Worketh Real Hard While He Waiteth"
There are no free rides, no short cuts to enlightenment. But Dear Ones, you have toiled up the mountain in many lives. You have laid the work, paid the dues. It is time to finish the job. You are powerful spiritual beings, pretending to be human. You can do this. Through proper focus, the pyramid can expand you. Now, we will close with one more sharing. The powernodes that exist on the planet are in essence white holes, areas where renewed energy is flashed into your universe. Pause and consider what we are saying. Take a moment. These coordinates, these energy conduits connect to all parallels, dimensions and probable realities! The Giza Pyramid sits upon the most centralized and powerful of these twelve supra white holes. The energies these create are capable of more readily solidifying thought into matter, but also to solidify desire, or prayer into experience. All Phi Pyramids, and all powernodes draw from these white holes and become subordinate points of them. When you enter into these spaces, Dear Ones, think with deliberation. Hold only noble thoughts. Mentalities of hate, fear and lack never serve you. We wish you life abundant, and challenge you to create it. You draw to yourself, you draw into your experience those things you mentally dwell upon. It is the Law of Attraction. All thought is amplified exponentially in powernodes and pyramids. Pray for what you want. And remember this: Love is the most powerful energy in the Universe. It is exponentially greater than hate. So, if you want to end war, you will not end it by hating war, you will end war by loving peace. Think on this concept, and apply it to all aspects of your life. Enter the Pyramid of the Cosmic Trigger accordingly. I am Metatron and I share these Truths. You are Beloved. And so it is. thank you for posting that Samarkis! i did some further exploration and found this. maybe we should have a group meditation on the Equinox, it is on a friday. "Greetings! I am Metatron, Lord of Light, and I greet you one and all ! Dear Ones, we sense each of you as you read these words in your present moment. Take a moment to feel our energy form around you as we embrace you in grace and love. We know each of you, by name, by vibration and by heart. Do you truly realize how much you are loved, and that we are always with you ? Indeed, we are ever with you. Now we speak this moment on a topic of great interest, that which may be termed the Return of the Dove. Masters, the Coming of the Dove is the return to the Magno-Crystalline Firmament as a requisite consummation of the Ascension. It is the crowning completion of the Crystalline Grid, and its time is nigh. The dawning of this return is a sacred oath fulfilled, a promiose kept. 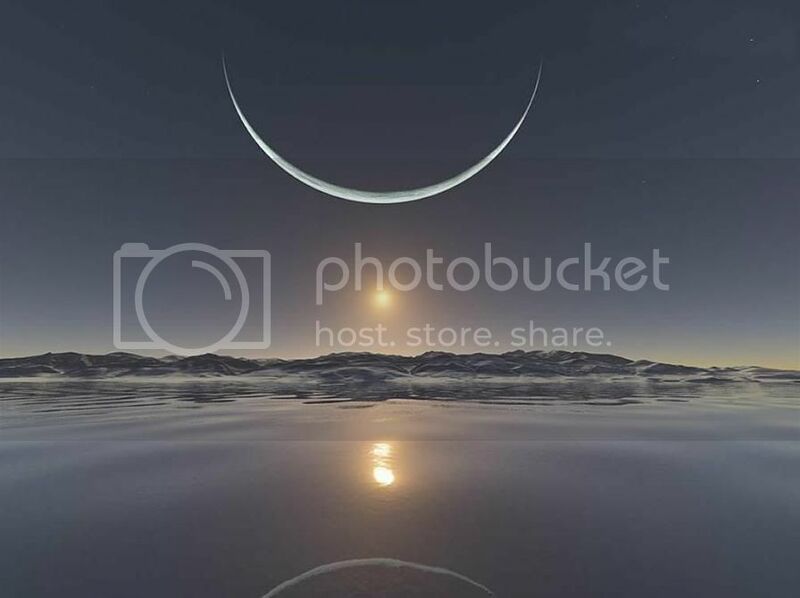 Its beginning phase is occurring on the March 20th Equinox in 2009, in which long dormant magnetic codes will be reactivated in specific generation points on the earth. Indeed, this equinox will initiate an incredibly intense energy for 21 days in fervid momentum through the post equinox full moon on April 9th. Dear Ones, all of you will discernibly feel the piercing frequency generated. It will be the most powerful and compelling magnetic wave-force released on the planet since the fall of the Firmament in the antediluvian age ( an era in which the earth's magnetic field was exponentially stronger than in current times). This release will be triggered by a download of cosmic crystalline energies received in specific pyramidal transmitor complexes . The purpose of the download is to reseed and activate ancient magnetic codes across the length and breadth of the planet. We have spoken to you previously about the rebirth of the new Planetary Firmament. This will externalize as two elliptical bands of iridescent frequencial arches that will encircle the earth as it did aeons ago. One of these is Electro-Magnetic in Nature, and the other Crystalline. These will revolve above the 144 double-penta dodecahedron of the 144 Grid. In highly technical terms, which we realize will be meaningless to many, the firmament will perform the function of transducing supra-crystalline frequency oscillations in a piezoelectric step-down to interface the grid, thus enabling full circuitry integration of the gamma-crystalline energies of the Unified Field from Tula, the Great Central Sun. In more understandable terms, the firmament will transform powerful celestial energy waves into a benevolent form that can be more easily received on the earthplane. So in a manner of speaking, the firmament is an enormous transformer and surge protector ! It is what will make the 144-Grid truly crystalline. In kind you may consider, in similar analogy, that the 144-Grid is your planets new server program, called Windows 2012, enabling a vast array of new programs for humanity and the Earth! Now, the initial phase of the new Firmament will begin with downloads of Akash or adamatine essence received thru specific portals . These activating light-energy downloads will be received primarily through the major Phi Pyramidal octahedron energies and structures across the planet. This will in turn activate a magnanimous fountaining of ancient magnetic codes within key storage sites, some of which have not been heretofore recognized. 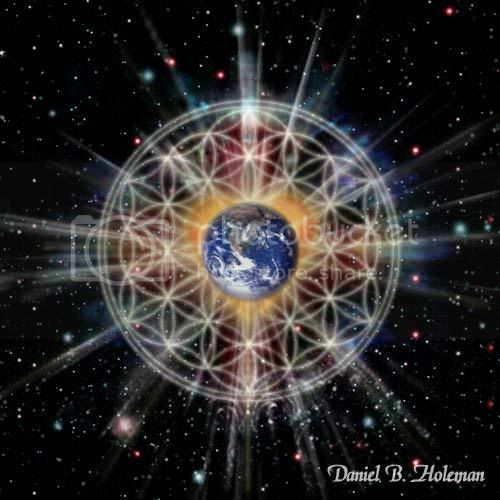 Indeed these energies, once synergistically combined and harmonically attuned over the few next years with the crystalline activation, will be the fabric of the New Earth, and will benefit the planet in serendipitous ways, embellishing the planetary grid- portals to the splendor of the crystalline frequency. The Red Pyramid at Dashur. Receival will also occur in certain powerpoints and natural pyramidal mountains emitting the octahedronal phi such as the Walsh Pyramid in Australia, Mt Edith Cavell in Canada, and the Materhorn in the Alps. These will also receive the crystalline magnetic trigger. The targeted magnetic codes that will awaken have been reticent on the planet since the initial days of Mu, Rama, Ignacious and Atlantis, aeons ago. The primary receiving points of the Cosmic Trigger are Giza and Moody Gardens, both aligned and harmonically attuned tri-pyramidal phi complexes. It is in fact the trinity aspects of combining three pyramids within these two complexes, that uniquely equips them to be the primary receival units. These will in turn distribute the energies to the other complexes through harmonic oscillation. Pyramids are indeed master receivers and transmitters. When they are triangulated, as they were in Atlantis and Rama, they are infinitely more vibrant and capable. Many of you will be drawn intuitively to participate in this as part of an ancient contract, a sacred promise kept. Especially those of you with lifetimes in the Guild of Earth-Keepers and the Guild of 777, which includes segments of the Templars, Druids, Olmecs, Indigenous Shaman, Mayans, Hopi, Essenes, Egyptian, Atlantean Enochians, Thothians and the Atla-Ra. In these lifetimes the Guilds worked to raise the frequencies of terrestrial electromagnetic energies in the form of leylines, earthen grids, vortex-portal systems and sacred geometric temples after these conscious energies were transferred into the Earth from the 'break-up' of the firmament. Now, we have told you that the original firmament was composed of two elliptical energy bands, emitting protective fields around the earth. The two bands of the original firmament differed in frequency and composition from the arcs of the new arcs being formed in the present Ascension. The ancient firmament had one arc that was electrical in nature the other magnetic. One emanated the energy of crystalline platinum, the other of crystalline gold. The two created a synergetic crystalline field within zero point energy that permeated the earth and allowed for ontological, fully aware, consciousness in a unified, (non-polar) multidimensional state before the planet became a world of duality. When duality was chosen, the firmament fell by design, and was replaced by a planetary grid. Your ancient text refer to this as the 'Fall of Man', we prefer to say that the Earth became a unique school at this time for soul growth amid those souls who chose the linear expansion experience of humanity within the grid system. The ancient firmament served in a unique capacity that not only fine tuned Cosmic and Crystalline Light, but sustained all life in a manner similar to the sun. The elliptical arcs of the firmament brought in a polished visible flashing aspect of Adamantine Essence (Akash) that often appeared as glittering etheric particulate. This essence enabled consciousness to fully transform resonate divine thought into instant material manifestation. It was how beings entering the pre-duality earth manifested physical and semi-physical bodies. It appeared in the skies as two elliptical arches that glowed at night in iridescent colors similar to what you call the northern lights or Aurora Borealis. The elliptical bands intersected and swirled and revolved in a gyroscopic manner around the planet. The width and omnipotent frequency of the elliptical bands vacillated and created an audible tone with the creative light vibration of OMM. It danced in the sky often forming and emitting kaleidoscopic eddies that appeared as a luminous angelic-white dove spiraling in brief flight across the heavens. A sense of protection and empowered well-being radiated the planet. The new 'Ascension Firmament' of 2012 will entail a combined electo-magnetic band in a single unit, and will be synergistically paired with an arc of crystalline frequency. It will indeed sustain mankind and enable a quickening of thought manifestation for those capable of raising the MerKiVic energies to the highest level, the level of the 24-point star. And Dear Ones remember as you work to raise the MerKaBa into the MerKiVa, that these are Metatronic geometric templates, necessary for you to rise into higher dimension. They are in zero field, devoid of gender format, neither feminine nor masculine, but of the Divine Integrity of your non-polar, integral soul! Approach their formation as such, in pure balance! The Crystalline Energies will in kind be initially activated in gestation for the second band of the new firmament between the trigger dates of the September Equinox of 2010 and the 10-10-10. This then is the second stage of the initial forming of the new dual-arc firmament. It will require time to integrate. The Firmament of the Dove will not complete itself until all the Master Atlantean Crystals are empowered and the 144 Grid is in full function on December 21, 2012. Indeed the new firmament will require just under two years after the Ascension to obtain full power and harmonic function with the grid. It will go into 50% power in March of 2013, and achieve full power in September of 2014. So the March 09 trigger is a predestined revitalization of sacred encoded technology. The Atlantean Masters knew of the code and utilized it in their technology. The unique electo-magnetic field from which this energy springs was understood by the Atla-Ra, Druids, Mayan and certain other guilds including the inner chambers of the Templars. Those of you who spent lifetimes in these guilds will feel a deep distant memory of this predestined event, and it will compell you to be apart of this. You will know deep in your heart that this unique magno-code due to awake from dormancy, is the father of the source you once called upon in smaller form, to work with leylines, dragon lines, vortexes and earthen grids. And while only a small sect of savants and secret societies knew how to tap into this energy, your early work laid the ground work for this omnipotent release. You knew of but have not yet expereinced its full power, because it has remained largely dormant for millennia upon millennia. This March you will feel for 21 days its full potency, and this you have waited and prepared for in many lives. It is an expereince you have earned, that you have worked toward. The opening triggered by the 09 March Equinox will be the first 'full-throttle' flow of this energy since the Atlantean era. It affords numerous benefits and benevolent secondary-effects beyond the primary cause of transferring the sacred magno-concentrate to the firmament. Among these is a greater awakening of the magnetic helix strands of the 12- strand human DNA and a key unification effect on the collective mind of humanity. All life on Earth, all energy on earth in every kingdom will be affected, indeed it is a multidimensional Global Event. During the 21 days, the magnetic shield around the planet will be somewhat opened and weakened slightly in a rebooting effect. During this time there will be literally thousands of ships from the Intergalactic Command of Ashtar and the Intergalactic -Brotherhood of benevolent Masters brought to the periphery of the planet to provide stability and protection and oversee the transition while this phase of 'open portals' occurs. In fact these Star Ancestors are your extra terrestrial origin, and all of you co exist within them. They are always helping your planet in numerous ways, but in this planned scenario, they will be present in vastly greater numbers to oversee the magno-shift. It may surprise you to know that many of you will simultaneously be aboard the starships , in multidimensional aspect, to supervise and observe this long anticpated occurance. The gathering will begin on the February 9th full moon eclipse. It affords a grand opportunity for those of you who are empaths to MerKiVicly experience your Sirian B, Arcturian and Pleadean aspects. The most aligned receival point of the Cosmic Trigger to activate these points in the Americas is Galveston Island, within the Moody Pyramid Complex. This unique trinity pyramid complex is in a direct alignment to Giza, and correlates to magnetic north. It is the combination of the three pyramids in-situ within a synergistic tri-harmonic alignment that allows their greater facility and power. As the Atlanteans and Orion Masters knew, pyramids in specific triangulation are extremely potent when celestially aligned and carefully placed in relation to one another. We will speak more on this later. The world remakes itself now and whether or not humanity in micro or macro is supportive of expansive change or against it, it is truly a moot issue as the inertia of time-chronology speeds past more quickly today than it did yesterday (in linear terms). All is quickening, time is accelerating as the Ascension draws nigh. So as time reshapes itself it will also reshape the experience of mankind, of visible and invisible forces of nature and that of the face of the Earth itself. Yet the heralded Ascension it is not an abstruse complexity of prophetic biblical script, but rather a natural and requisite expression of accelerating planetary consciousness. It is Jacobs ladder, and Dear ones, when you are on a ladder, you are ascending, descending or standing still. It is one of the three you see. It is always so. Masters, are you ascending the ladder? While on this journey of ascension, mankind can experience the multidimensional aspect of the Unified Field within the Crystalline Vibration and be able thru MerKaBic and MerKiVic geometric expression to revisit many of their co-existing articulations within multidimensionality and parallel. And at each of these junctures another layer and aspect of awareness is realized. As such mankind is given the opportunity to rise above duality and integrate and retrieve the fragments and unite the full soul into the Seat of Power of Divine SELF within the eternal NOW. This is the MerKiVic expansion into collective Mind. This will be a focal role of the 12-strand DNA unification that can begin in MerKiVic state within the activation of the 2009 March Equinox. Many many of you are now drawn into this awareness, driven by the flames of inner desire for Universal Truth. This is why your present spiritual communities are especially teeming with healers, channelers, teachers, facilitators, Grid workers, Earth-Keepers and Light Practitioners of every kind. Because those who have opened and sought diligently the burning call of Divine Spirit into their lives cannot help but glow in its glorious flame, and expand to share it with others. The Grid Points, power nodes, sacred sites , phi complexes and portals that dot the planet in specific patterns and specific purpose are the distribution mechanisms of the higher energy required to upshift the resonant frequency of your planet. They are tuning forks, inspired by perfection of First Cause. The exude the energy of 'home', of well-being, and those of you who enter into them in spiritual intent recognize this immediately. Accordingly one cannot help but want to be within them and absorb the pattern emitted within such areas in order to grow into and share the expansion of perfection. Those who dedicate themselves to this tuning can experience a nearness to Source that they feel is less available to them elsewhere. But the truth is that these fine-tuned energies are osmotic frequential schools, and once absorbed, once matriculated, the energy is retained within the established individuals MerKiVa. Many areas on the planet have then already ascended, via portal-lattices that may be called the stairways to heaven, but other areas require a bit more work. Specific areas that are a bit more dense now require more work to clear, and as a tertiary effect of the March Cosmic trigger and harmonic magnetic code awakening, the portals referenced in the Homecoming of the Metaphorical Dove, will bring in the lighter energy for that specific purpose. You see global frequencial balance must be attained. Each of you Earth-Keepers play a role in this. Indeed you become portable resonators. The Moody Gardens Pyramid complex of Galveston is one such area. Among this powerful complexes myriad utility, is its correlation to serve in lightening an area of 'energetic density', the area of Houston, Texas. Houston is in many aspects the corporate 'Energy Capital of the World', if one considers that your planet is driven by the hydrocarbons of oil and gas. Most of your Global Oil Companies are located or represented in this area. But let us be clear, it is not your use of hydrocarbons as a power source, per sei, that is the principal polluter of the energies of which we speak, rather it is the greed and manipulation of distributing them. Indeed there are far better sources of energy available, but Dear Ones, the Earth, the sentience of the planet, does not release any resources unwillingly. We tell you the same dense aspect requiring clearing exist in Wall Street (New York) and many of the corporate centers around many of your major global cities. It is not the business or industries themselves, not the day to day workers, but rather the greedy tactics of the profit plans. It is not to imply that equitable returns on investment are not just, indeed abundance exchange is appropriate in the new paradigm, but the distribution and exchange must be befittingly balanced in the new energy, for the desired perfection. That is why your economies are rebooting. As such specific new -missioned portals are forming around the planet to lighten these energies in tandem with the rebooting. Many existing portals are taking on new roles, and many new ones, such as Moody Garden Pyramids in Galveston, Texas have assumed these clean-up roles over the past few years. Other similar cleansing unit portals are emerging in major industrial and corporate cities across the planet in order to expedite planetary balance. Now in 2005 the channel with the Beloved Ronna Herman, conducted a ceremony within the Moody Gardens Pyramids to bring in the Golden Spiral. This was especially important, and all involved had a special role in this activity, an ancient contract was being completed. But we will tell you that other ceremonies had occurred previously, and the 2005 event has sparked many others to recognize the importance of these geometric Crystalline Light Temples. The Philanthropists who funded, originated and completed the project were extremely advanced souls. On an intuitive level, they understood the greater purpose of this complex. Shortly after completion, the ancient crystal skull Max, who is indeed of Arcturian construct, was taken into the complex for ceremonial attunement and anchoring of intent, by Joanne Parks, the caretaker of this potent crytsal skull at the request of the most advanced of the founders. There was indeed great purpose in this event. It was a homecoming, in effect. We tell you that an entourage of Arcturians joined them, and are involved in the refinement of the energies along with those of Sirius A and B. It is why Master Dolphins are inside the Blue Pyramid, the Aquarium unit. It is why the location is located on the beach front of the Gulf of Mexico but was undamaged by the recent ( and future) Hurricanes. Pyramids themselves are extremely powerful sacred geometric engines that by their nature and construct penetrate, receive and culminate higher dimensional forces. They are celestial transmitters of the supreme Gestalt that you think of as GOD. This very description of deity may not be understood by some of you, but nevertheless, you should not try to objectify the energy of ALL THAT IS. God is an omnipotent energy, the sum of all consciousness, and whose whole is far far more than the sum of its parts. Your ancients have always known that 'ALL THAT IS', can be accessed in stepped down format on the Earthplane through specific matrixes of geometric focus. Your 144-Crystalline Grid is one of these and your MerKiVa is another. The two are intricately magnetically interconnected. The grid is the living conscious MerKiVah of the collective Earth, of which mankind is an intimate part. Now the three Pyramid complex on Galveston Island was indeed built in a strategic alignment, and for philanthropical and frequencial purpose. One unit is an aquarium housing Master Dolphins, another is a bio rainforest with a geological cave containing massive clusters of quartz crystal, and the third is an academic museum pyramid, glassed in copper tone. Appropriately constructed and spiritually intended pyramids on the Earth plane become living conscious energies, capable of myriad properties that are unrecognized or disavowed by your mainstream academia. And while the intent for which they are employed affects the interface of these conscious living geometric batteries, their very design will not allow for denser energies to culminate or expand within them. Yet when approached with appropriate intent, the energy within pyramids stores and transmits data similar to quartz. According to how they are aligned both terrestrially and celestially they can create electromagnetic anomalies, an aspect that alters gravity and dimensional time. Both weightlessness and a time distortion occur at specific frequencies within them, both slowing and accelerating light and fluxing the ionic ratios within and around them. Now, approximately 5 miles from the area of Galveston Island, an ancient ceremonial Pyramid complex existed in a coastal region, now submerged and covered in the sedimentary silt and slime of the ages below Gulf waters. The Crystal Skull now called Max was among the 13 skulls located within it. The Moody Gardens Pyramids have taken on the multidimensional energies of the submerged Atlantean complex and are now fully formatted to play a major role in the Cosmic Trigger. The Moody Garden Pyramids are axialtonally attuned to the energies of the Giza complex and to a potent degree to the Yucatan Pyramids. We tell you that Pyramidal Temples exist in timelessness and co exists in parallel dimension within the timeless void. This is why the Pyramids at Giza can never be accurately aged because once constructed they surmount linear time and the nature of their energetic geometries supra-impose in parallel and emit etheric doubles in multi -dimensional timelessness. The paradox is that once built, they always existed. It is in fact this aspect and locale that inspired the philanthropical reconstruction of pyramids in this precise location for the Restitution of the Sanctuary and Sanctity of the Dove. 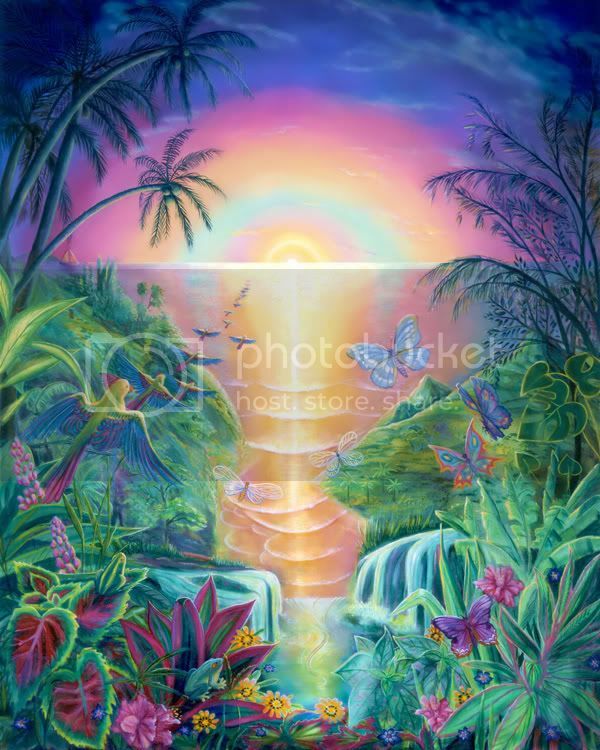 The Coming of the Dove offers an energy portal and dimensional expansion to you that can faciliatate a richer more rewarding sojourn with infinite ways in which to ascend Jacobs Ladder. The pre-Ascension brings a quickening and crucible that activates the expansion of TRUTH and the fire of AGNI within and without, and in so doing will allow you to choose a reality rather than have one chosen for you. Indeed this is a Cosmic Trigger in March and April is monumental event for the family of man, and it is a family of which we speak, one of which you are all a part. You can participate in this event, if you are so compelled, (and many of you are) by meditative visualization of all humanity connected in love. We offer this exercise to take part in the trigger. Form the MerKaBic star tetrahedron, the 8-pointed star around you, and begin toning the OMM. Practice the infinity breath and convert the 8-pointed star to the 12-pointed star of the MerKiVa. If you are in Western Hemisphere, focus on and visualize the Moody Gardens Pyramid complex in Texas. If you are in the Eastern Hemisphere, direct your energy process to the Tri-Pyramids of Giza. Picture the Blue Pyramid in Galveston and the Kings Pyramid in Gizaq as simultaneously receiving the initial spiral of energy. Then visualize all 3 pyramids in each complex circulating the energies, and see the Giza complex harmonically connected in a golden qaxialtonal line to the Moody Garden Pyramids complex and vice-versa. Once connected visualize these two connecting to every pyramidal complex forementioned across the globe. See all receiving the golden spiraling energy download and glowing in great intense light, covering the planet . Then place the Earth (and Grid) in an enormous Octahedron, as you see in your minds eye the Cosmic Trigger of Celestial Crystalline Light flow through the Pyramidal Phi Complexes and Octahedronal power points. Feel the upsurge flow of the awakening coded electro-magnetics of the earth rise through your own physical forms and chakric systems. Absorb the energies and beam them to all around you. Next, focus on the 14 sacred code-magnetic springs fountaining energy into the heavens. Visualize the upward flow of these energies to the 144-Grid encapsulating the Earth. Place a golden Arch, a glowing Elliptical Band forming around the planet and grid. 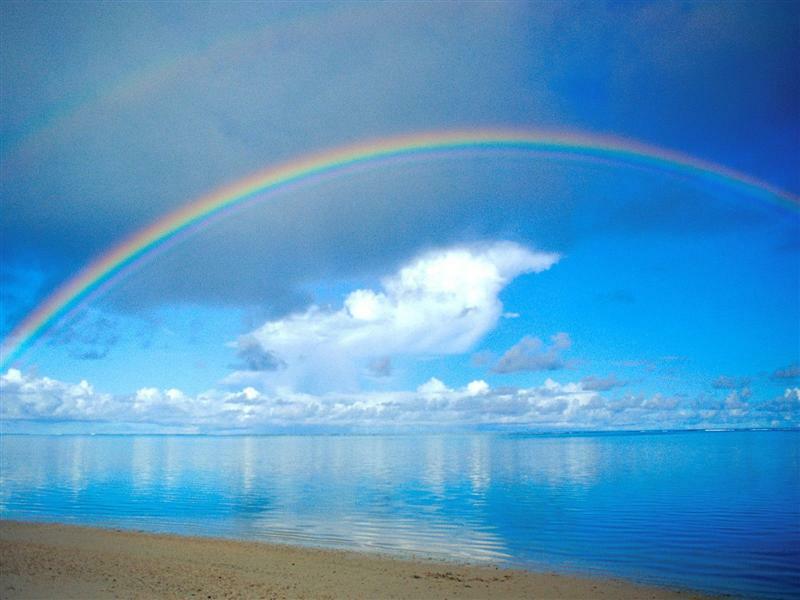 See it as gold in color, then tone the Omm amid a sense of joy and love. As you tone, visualize the Platinum Ray of the Crystalline Field flowing the soft nurturing energy of the Divine Feminine through the Golden Arc and swirling around it to form the crystalline band. Practice this as often as you can during the 21 Days of the Dove. And we tell you in humor and light that while these Golden Arches are not for fast-food, billions will be served! In truth your Cosmos, your macro and micro reality is Metatronically formulated in the Unified Field . And Dear Ones, know this energy is within and without EVERYTHING, including and especially YOU!!! It is the energy you call God, it is All That Is, All That Was and All That Will Be. It is acutely aware of each bird that falls and each flower that blooms in verdant fields and arid desert. So never doubt this TRUTH : Creator God knows each of you by name. You are all powerful divine spiritual beings, an intricate and vital spark of the 'All That Is'. It is time to remember. It is the Return of the Dove. The Ascension is occurring, one heart, one mind at a time. And Dear Ones, it is on course. Do not doubt it. In closing we ask you to focus on joy, and be the change you desire." I am Metatron, and I share with you these Truths." Thankyou for your kind words,just follow you heart and im sure you will find the answers you seek. Im sure there are like minded souls near or around you,and many more will awaken as we spiral closer to 2012 Nexus event. Through this thread and others like it we can evoke like minded souls and truly make a difference . This link we enable you to see who is physically close to you maybe contact local ground crew for 9th May even if you are not yet at the stage where you are ready to group meditate . Im sure it will be an enlightening experience. If you close your eyes and open your ID (inner mind) you will see that we are much closer to each other than we think for we are all one. Some have accessed this point by shamanic herbs(which is why PTB make it more illegal in most places more than street drugs!!!) Others have had near death experiences that allows the Pineal Gland to activate and their higher self or Guides sent them back to finish their purpose on Earth....Some have been tenacious and do not have family or heavy schedules that they can work on meditations with frequencies and detoxes,etc and have been successful!! A rare number just have a "gift"!!! All I can say is that if your visions do not look psychodelic....and it is always when the body is prone..
you probably have not activated yet!! No worries though!!! Many are working toward this and it is IMPORTANT to prepare your body and mind with knowledge,to de-program past views & energies,to do emotional clearing,make changes that are condusive to your new vantage point-the rest will come!!! And just relax in your knowing Truth!!! Much Love & Light to you & your family!!! I am now looking more into the meditation, previously i was not ready to learn and did not wish to cloud my mind with various methods practices etc etc. The chakra was something i had not looked into but sang to me,so i am now looking into this and Astralwalkers recommendation. [QUOTE]Samarkis I highly reccomend the free e-books from www.michaelsharp.org !!! I have been doing this i feel all my life and i am now understanding why i have choosen the paths i have taken. And the closer to 2012 i come i will realize more of the Truths that are locked within at a much accellerated rate. But also with an open mind to the many religions in fact a respect admiration that it followers have, something in common to share a community a oneness. But i also see a lot of war over various religious reasons and have never felt pulled to religion or belief. paramountally right above all, has been easier for me to see the Truth within this thread. For several years i have brought my son and daughter up the best i know how with uncondittional love both ways.What a blessing they truly are. I have come across many times within this thread and links about Vegatarianisam. My original thoughts were what we are taught or programmed as young children that meat is essential. Whilst bring up our children we decided that we would eat as healthly as possible no pre packaged food all fresh meals fruit veg. Naturally over time we have cut out virtually all meat except chicken,and now this is being left by all . I think we are naturally progressing to to this. emotional clearing /changes new vantage point will pm you at some stage. Love @ Light to you and yous and to all. We research alone but share and learn as One. Many thanks for the channeling from your friend (wow),i hope they join this thread soon, im sure there is much we can share. 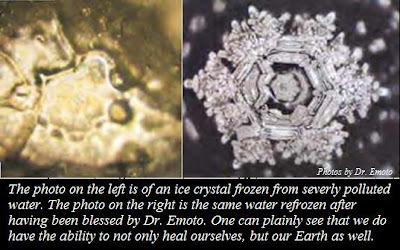 The photographs and information in this article reflect the work of Masaru Emoto, a creative and visionary Japanese researcher Mr. Emoto has published an important book, "The Message from Water" from the findings of his worldwide research If you have any doubt that your thoughts affect everything in, and around you, the information and photographs that are presented here, taken from the book of his published results, will change your mind and alter your beliefs, profoundly. These photographs show the incredible reflections of water, as alive and highly responsive to every one of our emotions and thoughts. environment, whether toxic and polluted or naturally pristine. Masaru Emotos extraordinary work is an awesome display, and powerful tool, that can change our perceptions of ourselves and the world we live in, forever. We now have profound evidence that we can positively heal and transform ourselves and our planet by the thoughts we choose to think and the ways in which we put those thoughts into. REIKO: We have read your book The Message from Water, and we introduced it on our website in our August issue (see "Conscious Water Crystals: The Power of Prayer Made Visible"). It has been our most popular article, with its readership increasing every week, and has raised many questions. DR. EMOTO: This is one of the more difficult areas to clarify. However, from continuing these experiments we have come to the conclusion that the water is reacting to the actual words. For example, for our trip to Europe we tried using the words "thank you" and "you fool" in German. The people on our team who took the actual photographs of the water crystals did not understand the German for "you fool", and yet we were able to obtain exactly the same kind of results in the different crystal formations based on the words used. REIKO:Could you then see the effect that energetic healing or prayer has on a person by looking at the crystals formed by their blood or urine? 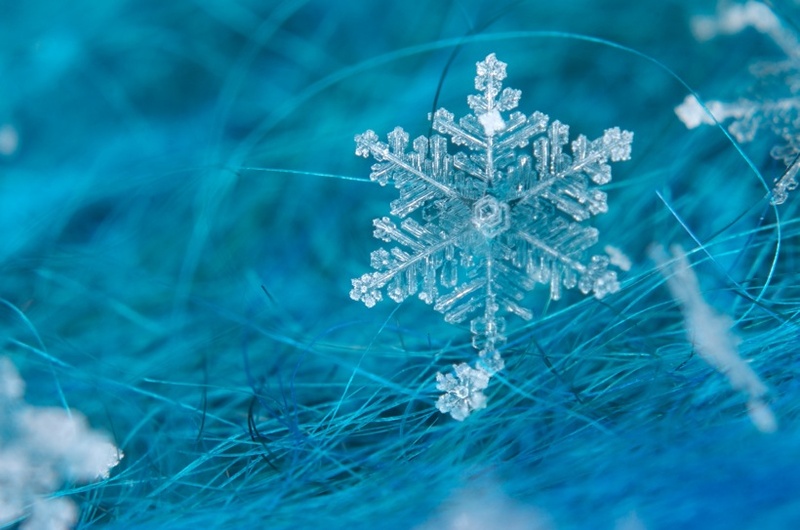 DR. EMOTO: As far as experiments related to the human body are concerned, there are a lot of subtle influences that also need to be taken into consideration. So although we are looking at this, we have not publicized any information yet. However, you can look forward to hearing about our findings on this in the future. REIKO: If we could imbue water with the energy of various words, for example, with the word, "health", could we then use the water that has that vibration in it and use it to do things like grow food, water plants, etc? DR. EMOTO: We have not tried this, but some people who have read the book are experimenting with bottling tap water and taping words like "love" and "appreciation" on the bottle and using that water to water their plants, or to put cut flowers in. They are finding that their cut flowers are lasting much longer, and that the plants in the garden are much more radiant. REIKO: Once a certain vibration is introduced to the water, how long does the water "remember" that crystalline structure? DR. EMOTO: This will be different depending on the original structure of the water itself. Tap water will lose its memory quickly. We refer to the crystalline structure of water as "clusters." The smaller the clusters, the longer the water will retain its memory. If there is too much space between the clusters, other information could easily infiltrate this space, making it hard for the clusters to hold the integrity of the information. Other micro-organisms could also enter this space. A tight bonding structure is best for maintaining the integrity of information. DR. EMOTO: Slang words like "you fool" destroy clusters. You would not see any crystals in these cases. Negative phrases and words create large clusters or will not form clusters, and positive, beautiful words and phrases create small, tight clusters. Achieve greater hydration, better nutrient intake and toxin elimination. Read about the Precious Prills and ADR water structuring devices that have received such high praise. DR. EMOTO: Yes. During our evolution, we learned what sounds were dangerous, what sounds were soothing and safe, and what sounds were pleasurable, and so on. We slowly learned about various vibrations of the laws of nature. We learned this through instinct and through experience. We accumulated this information over time. We started out with some simple sounds like "a" or "u" or "e," which evolved into more complex sounds like "love." And these positive words create "natural" crystalline structures -- which are all based on the hexagon. So words actually convert the vibrations of nature into sound. And each language is different. Japanese has its own set of vibrations that differs from American. Nature in America is different from nature in Japan. An American cedar is different from a Japanese cedar, so the vibrations coming from these words are different. In this way, nothing else holds the same vibrations as the word arigato. In Japanese, arigato means "thank you." But even when there is this mutual underlying meaning, arigato and thank you create different crystalline structures. Every word in every language is unique and exists only in that language. REIKO: Yes. There is a special combination that seems to be perfect for this, which is love plus the combination of thanks and appreciation reflected in the English word gratitude. Just one of these is not enough. Love needs to be based in gratitude, and gratitude needs to be based in love. These two words together create the most important vibration. And it is even more important that we understand the value of these words. For example, we know that water is described as H2O. If we were to look at love and gratitude as a pair, gratitude is the H and love is the O. Water is the basis that not only supports but also allows the existence of life. In my understanding of the concept of yin and yang, in the same way that there is one O and two Hs, we also need one part yang/love to two parts yin/gratitude, in order to come to a place of balance in the equation. In Buddhism, we talk about attaining sattori, or reaching enlightenment. People who attain sattori do not become ghosts. They are able to achieve a certain stage of development at the soul level and return to God for a while before they move on to their next assignment. In the past 100 years the world's population has increased from 1 billion to 6 billion. During these 100 years, war and capitalism has dominated the planet. Rather than being able to detach from our desires, the opposite has been true. Our desires have grown and grown. Very few people have been able to attain enlightenment in this environment. Few souls have been able to go "home" and I believe they have remained on Earth in the form of water. This connects into the concept of reincarnation, where these spirits keep falling back to Earth and need to redo their lives here. DR. EMOTO: That is what I believe, yes. The Japanese character for spirit is a combination of the words "rain" and "soul." People who have seen ghosts report seeing them in water or in places where there is a lot of humidity. It's as if the imprint of the soul, which is in the form of water, suddenly takes form when surrounded by water or moisture -- much like a mirage. By receiving beautiful thoughts and feelings and words and music, our ancestral spirits get lighter and are now able to make the transition "home." When we consider this, we can see the importance of traditions like Obon [a Japanese summer tradition where ancestral spirits are invited back to spend time with the family, and the ancestors are taken care of and respected]. When we are alive, the human body is at approximately 36 degrees Celsius. This is the temperature of the fluids in the body. When we die, this goes to zero degrees Celsius. When we die and go to the other side, crossing the river, we are no longer able to move our bodies. But the crystalline structure of our soul emerges. It's like water. When water turns to ice, the crystalline structure becomes visible, but it also becomes immobile. So "crystal" equals "spirit." Last edited by Astralwalker; 03-07-2009 at 07:15 AM. This is the whole movie,What the bleep do we know. http://www.watch-movies-links.net/mo...eep_do_we_know . I'm so happy you brought Dr Emoto into your thread.His work puts such an endless amount of possibilities, to the equation of how to fix the world. Point blank and so simple. Last edited by mudra; 03-07-2009 at 11:09 AM. Allright! Here we go again! Level 500 is the level where Love becomes more and more Unconditional. Level 540+ is the level of Unconditional Love. "I would sincerely promote that Veritas pursue an interview with this remarkable man." I am hereby responding to the request and would like to extend an invitation to Mr. Andov. Obviously, Mr. Andov (Astralwalker) has a vast array of knowledge to share with humankind and if this thread is any evidence, then I am publicly announcing that we will schedule it. Last edited by manticore; 03-08-2009 at 06:32 AM. Here are two clips that have to do with explaining Master Numbers and the second to explain what is the use of pyramids with consciousness!! Thank you for the second post of Metatron!! Good work Unlimited Mind!!! Thank you Mel. I really appreciate. It will be a privilege. I will do my best to present the information to even more people, so anyone who resonates with the idea can tune in. Once more thank you for your invitation. I really appreciate. Thank you Samarkis, Mudra, Alchemikey, Galaxy Girl, Maletzky, Truthseeker360, AussieG, Luminari, Vagabunda, Greybeard, Perseide, Jazzgad, Paramartasaya, Unlimited mind, Fossileyesed, Sanat, Choosenone, Lightbeing, Henry, Robski, PhidPiper, Czymra, Dayzero, Kathleen, Phireflye, Surial, Mr Magoo, Rhythm, Futureyes, Carmen, Judykott, One One Seven, Kerry Cassidy, Lawlessline, Yettone, Moonmadness, Startrekka, Carol, Firefly, Saggyash, Jonathon, Mpea, 777The GreatWork, Zeddo, Burgundia, Antonia, Nebula, Ara, Humble Janitor, Jacqui D, IndigoChild1986, Karlia, Relayer, Exchanger, Selaviv, Macrostheblack, Giovonni, Global Nomad, Aussie Babe, Bonnie, Franciejones, Panpravda, KathyT, Jenny, Iainl140285, K626, Myra, PK47, J rod7, Oneness, Marian-Librarian, Tez, EnemyofNWO, Koyaanisqatsi, JesterTerrestrial, Iainl140285, Feardia, Tag, Jenny, Micjer, EndJoy, and everyone else for helping creating this. Last edited by Astralwalker; 03-08-2009 at 10:59 PM. The universe is a dance, alive with holy energy that brings forth and engages all things in rhythmic relationship -- stars and galaxies, suns and planets, birds and butterflies, winds, waters, and soil, toads, and humans -- all in one grand harmonious dance! Earth is a divine work of art in process, a poem unfolding, a song ever being sung, always bringing forth greater and greater expressions of beauty and love. This I believe! Each of us is a dancer in this cosmic dance. Each being, each human alive today is here it participate in the creative adventure that is the universe. There can be no spectators. Some deep longing -- each one's unique gift, a passion for belonging, our dream for a world of love and unity -- is urging us to get up and dance! I see that I am not a separate entity, and never could be, because the tiny particles of my body are dancing, intermingling with the particles of life around me. It is not a matter of "them" and "me", whether this be people, rocks, sea anemones, clouds, or rabbits on the run. Rather, it is a matter of "us...."
It seems that some of you might not have used the latest musical file we have. Make sure that before each meditation you check the nexus site for update. Astralwalker and everyone on Nexus thank you for making this wonderfull experience possible. Thank you Samarkis, Mudra, Alchemikey, Galaxy Girl, Maletzky, Truthseeker360, AussieG, Luminari, Vagabunda, Greybeard, Perseide, Jazzgad, Paramartasaya, Unlimited mind, Fossileyesed, Sanat, Choosenone, Lightbeing, Henry, Robski and everyone else for helping creating this. Astralwalker has made an invitation leaflet to the 5/9/9 event. Feel free to use this leaflet to help us promote the 5/9/9 event by sending it to as many friends, acquaintances and relevant associations that you can. Get busy friends. Remember we need at least 7000 people on these sites.